By now, we have been driving around Iceland for almost four weeks. Our final stretch back to Reykjavík took us along Route 1 or the Ring Road. If we’ve not mentioned before, this “highway” is never more than one lane in each direction, always passes through towns rather than bypassing them, collapses to a single lane when crossing bridges and frequently reverts to a gravel road in more remote sections. The 130 km stretch between Höfn and Skaftafell might just be the most stunning stretch of highway in Iceland or perhaps anywhere for that matter. The Ring Road here skirts the southern edge of Vatnajökull National Park, home to Europe’s largest ice cap and mother to countless glaciers that flow down toward the ocean in massive rivers of ice that sculpt the mountains they plow through. At least a dozen glaciers are visible from the road at a relatively close distance. We spent a few days exploring the glaciers and searching the lagoons left behind where they are receding in hopes of finding the perfect icebergs to photograph. We had seen amazing photos and had been told of several small lagoons that might yield a gem. We chased up and down bumpy gravel roads, pushing the limits of our 2WD Toyota and ate our fair share of dust, but in the end we came up short. Although we explored 5 different glacial tongues and marveled at their enormous size, none produced the kind of subject we were looking for. The problem, in part, was the weather; we had bright, sunny days with blue skies and few clouds. As it turns out, icebergs show better in overcast conditions and best after a recent rain. As icebergs melt, the surface crystallizes, turning to dull white and grey. This all washes clean after a rain revealing clear, blue ice, and this is what we were truly hoping to find. The centerpiece of southern Vatnajökull is Jökulsárlón, a 17-square-kilometer lagoon that harbors giant icebergs calving off the Breidamerkurjökull glacier before they flow out into the North Atlantic. Words cannot adequately describe the scene, but photographs go a long way; the lagoon has been used as a film set for such films as Lara Croft: Tomb Raider, Batman Begins and two James Bond films. Commercials and magazine spreads often use it as a backdrop. In fact, we saw a swimsuit model shoot in progress—ironic given that the water these poor girls were standing next to was near freezing! 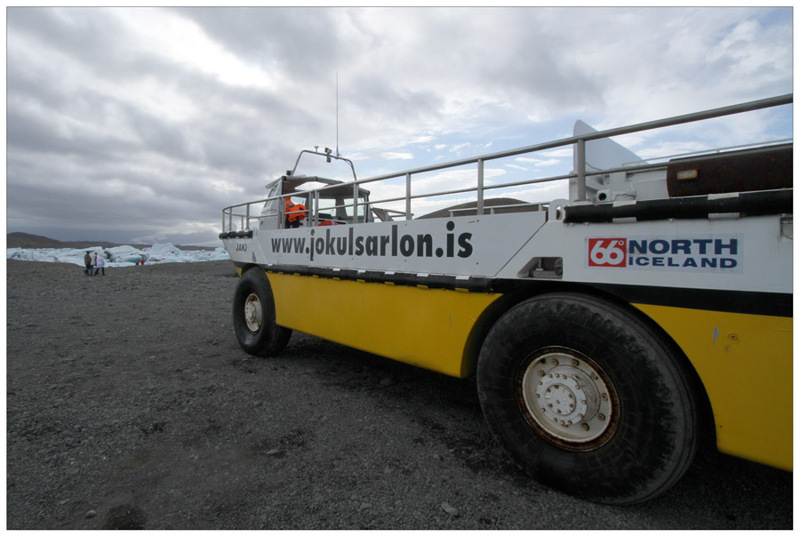 The first day we saw Jökulsárlón, it was too bright and sunny to produce great photographs, so we diverted to other activities in the area. But when we came back two days later, conditions were much improved. An almost smooth, grey blanket of high clouds masked the sun showcasing the intense blues of the ice. There are several ways to experience the lagoon: from shore, in a plane overhead, on a crowded amphibious boat or in a smaller zodiac. By chance, we had met a zodiac skipper in Höfn a few nights earlier. 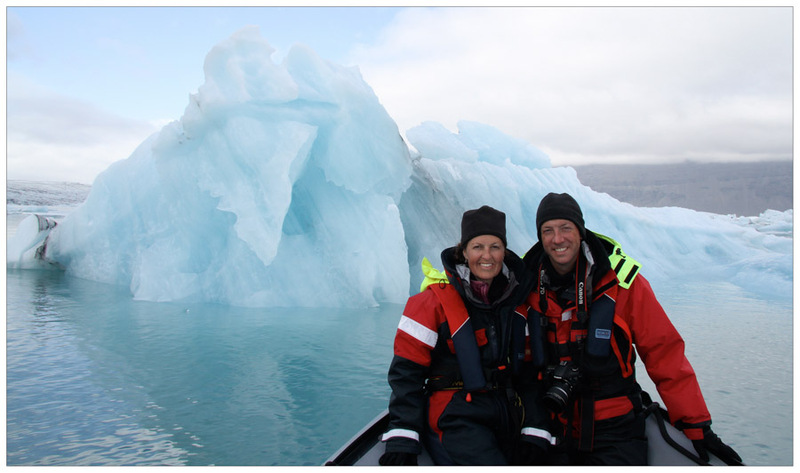 Runi shared some of his own amazing photos taken from his boat and strongly suggested that it would be worth the extra krona to experience the icebergs from a zodiac. So when we returned, we sought out Runi, and, after suiting up, we were lucky enough to take a ride on his boat. As it turned out, this was his last tour of the afternoon, and we ended up on a “private” tour for two with our fellow photographer-friend. The next hour was one of the most exhilarating photography/nature encounters we’ve ever experienced. 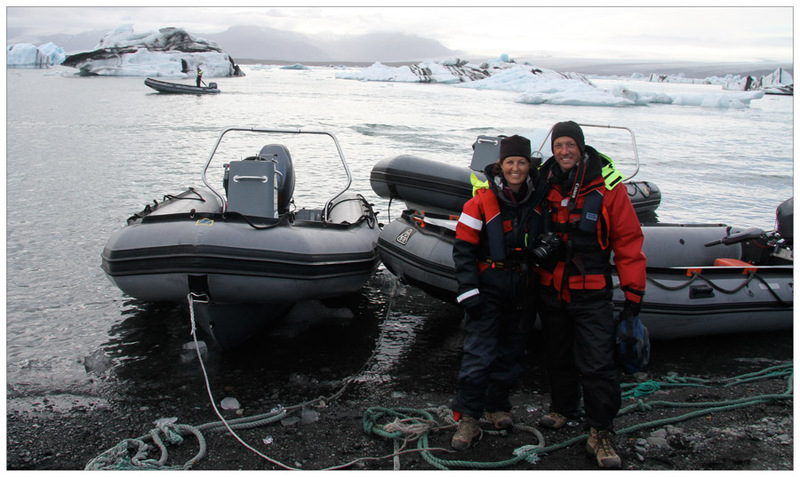 Runi whizzed us around the lagoon, circumnavigating hulking icebergs and nosing up to smaller ones. He showed us ice caves, waterfalls and strange ice sculptures to capture on camera. Next he took us up within safe distance of the face of the glacier. Only then could we grasp the sheer size of it. The lagoon is 7 km long, and the face of the glacier rises over 200 meters. When you consider that icebergs reveal only 10% of their volume above water line, you begin to develop real respect for these frozen monsters. On the way back, we were treated to a rare event. As we rounded one large iceberg, a huge piece of it calved off with a loud crack and splash. It submerged and resurfaced, and we saw the most intense blue “baby” iceberg bob and reposition itself into a new ice sculpture. We were lucky enough to be the first to see it. In the end, this is what makes Jökulsárlón a fun destination for photographers; unlike other natural sites, this one is constantly in flux, offering new opportunities for exploration. All you have to do is stop, look and wonder. Skaftafellsheidi: Oh, What a Hike! 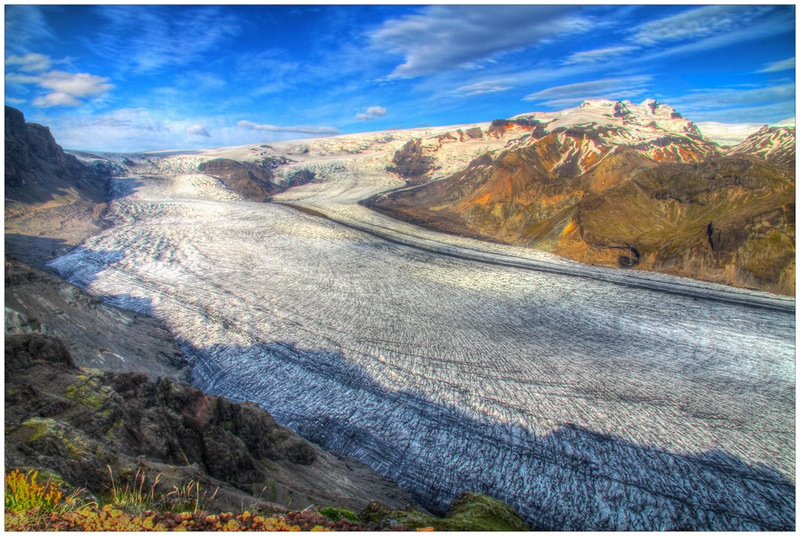 The main access point to the southern sector of Vatnajökull National Park is Skaftafell, where there is an assortment of outdoor activities to do, including sight-seeing flights, glacier-walks, drives onto the ice, as well as a numerous day hikes. Not prone to thrill-seeking, we opted for the Skaftafellsheidi hike, one of the most popular hikes in the park and for good reason. The 14-kilometer loop starts at the campground and first passes the often-photographed Svartifoss waterfall. Like many Icelandic waterfalls, it is surrounded by a cove of hexagonal columnar basalt, and it really is quite striking. We happened to be there on a beautiful, sunny day, which was great for our hike but not so good for waterfall photography. Instead of shooting, we enjoyed a picnic lunch and marveled at the locals taking advantage of the relatively warm temperatures (maybe 60ºF) to take a quick dip in the chilly glacier-fed waters. From there, we lost the majority of the people as we started climbing in elevation towards the Skaftafellsjökull glacier. Along the way, we were treated to clear views of all the peaks in the immediate area, and we could see various glaciers and ice fields off in the distance. It was quite a scene to behold, and, although extraordinary, it did not even come close to what was awaiting us at the apex of the trail. We were led right up to a sweeping view of the glacier as it flowed out of the icecap toward the valley below. Although we have seen many glaciers before, the vantage point we had of this one from this trail was absolutely incredible. Although we have seen many glaciers before, the vantage point we had of this one from this trail was absolutely incredible. The black and white-patterned ice seemed to stretch forever in all directions, and the scale of it all was difficult to comprehend. It seemed like you could reach the mountains on the other side in just a few minutes, yet we knew that kilometers of frozen waves separated us. As we finished our loop, we hiked alongside the river of ice and enjoyed the spectacular views all the way back to the campsite. In our humble opinion, this hike is an absolute must-do on a visit to Iceland! Another interesting way to experience southeast Iceland is to head out to Ingólfshöfdi, or the Cape of Ingólfur. The cape is significant for two reasons. Way back in AD 871, a Norwegian Viking named Ingólfur with a bit of wanderlust landed here and spent the winter before heading on to what would eventually become Reykjavík. Thus, Ingólfur ranks as Iceland’s first settler, and the cape that bears his name is Iceland’s version of America’s Plymouth Rock. Nowadays, the main reason to venture here is to see the puffins and greater skuas that inhabit this bird cliff. The only problem is that it is completely inaccessible to all traffic… except by way of a tractor-drawn haywagon. 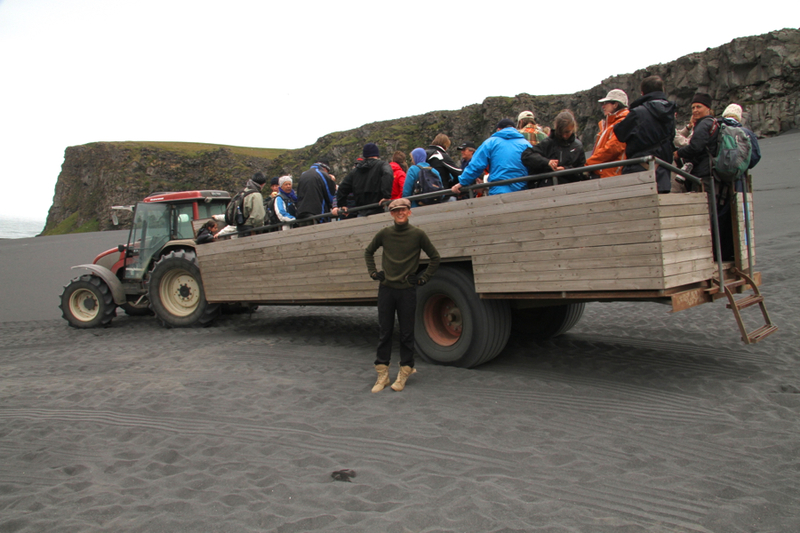 So, feeling a little bit like sheep going to market, we boarded the haywagon for a 30-minute trundle across the glacial flöts (streams of glacial runoff) and a fine-grained, black basalt sand beach. Once at our destination, we slogged our way up a giant sand hill to the top of the bird cliff where we were treated to more puffins than we have ever seen in one place. The challenge for the photographer here was to isolate one, two or three puffins for a good composition, which was not easy to do with so many of them clustered together. We also got close to the nasty-tempered greater skuas and a few of their chicks. As a combo nature and culture destination with a novel form of transportation, Ingólfshöfdi was a great way to spend a few hours on the southeast coast. Way back at the campsite in Borgarfjördur Eystri we met a very nice English/German couple who had traveled to Iceland on several occasions. We asked if they had any advice on places in the south, and their eyes lit up. They said that we had to make a stop in Hveragerdi, one of their absolute favorite towns in Iceland. Hveragerdi is actually only about 45 minutes outside of Reykjavík, and it feels like a small slice of Icelandic suburbia. The town is unique, though, because it is built on an active geothermal field. In the middle of town, there is a geothermal park. Unfortunately, it had just closed when we stopped by, but apparently you can boil eggs and bake bread in the geothermal vents there. The town is also home to a university specializing in horticulture, and much of the produce and flowers that are grown in Iceland come from the many green houses here that are powered by the geothermal energy in the area. Pretty cool, huh? The best thing about Hveragerdi, though, is that it has one of the most unique short hikes in Iceland. Just outside of town is an area called Reykjadalur. There is a beautiful 6-kilometer round trip hike that takes you through the rolling green hills and boiling mud vents of the area. It is not nearly as dramatic as the more mountainous regions of the highlands or as astonishing as the mud pots near Lake Myvatn, but this little hike is surprisingly picturesque. After about 2 kilometers, we crossed a river and tested the waters. Just as our friends had promised, it was warm! Really warm! The source of this river is about a kilometer upstream where the water emerges from a spring in the ground at a boiling temperature where you can actually see the bubbles. As the water travels downstream, it gradually gets cooler, and, just like beavers, the industrious Icelanders have built little dams to collect the water into pools. The higher up you go, the hotter the water gets. All you have to do is find a temperature to your liking. Since we have been pretty keen on the whole hot pot experience, this was an opportunity we could not pass up. We started testing the water near the top and found it way too hot for our comfort. After several attempts, we finally found the perfect pool and went in for a dip. The water was delightful, and we tried to savor it for as long as we possibly could. What a very surreal experience to bathe in a hot river! As we lounged, bright green algae from upstream drifted by and reminded two vegetable-deprived vegetarians of some fresh chopped spinach. We were seriously tempted to gather it up for dinner but thought better of it in the end. Regardless, it was a very unique and typically Icelandic experience. What a cool country this is! GORGEOUS!! i need to get there!! wow. i can imagine the conversations you had along the way. and the BIRDS! on my…. want to hug a puffin! gorgeous glacier pics. outstanding. Thanks, Jenn! We know you would love it here, especially given your new-found passion for birding. Book your trip! Magical!!! ….and you found a river that was “just right!” Thanks for gorgeous vicarious vacation – oohing, ahhing, and smiling as I “travel” with you! Yeah, we felt like Goldilocks and the Three Bears. “This one is just right!” Thanks for reading. We’re glad you are enjoying it. Happy Belated Birthday Alison!!! I have sooo enjoyed reading your blog and looking at your amazing pictures. I think that I have convinced the kids that we should take a trip to Iceland. They were especially taken with the pictures of the puffins. Thanks for sharing! You should definitely come to Iceland. The kids would love the swimming pools. Lots of them have water slides and fun things for children to do. Thank you for reading and a very happy birthday to you, too! a great read and beautiful photos – staying for long in Iceland? sweet – welcome back. looking forward to more posts! Very cool! Unfortunately, we are not on Twitter. I don’t think our everyday lives are exciting enough to merit a daily feed 🙂 We are headed to Tanzania soon to hike Mt. Meru and Kilimanjaro and then will go on safari for a few weeks. We are looking forward to our trip and to having some more travel experiences to blog about. Thanks for reading!